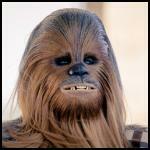 As the title says, I am going to venture down the Chewbacca road. I will be working on the Solo version and plan to finish before Celebration. 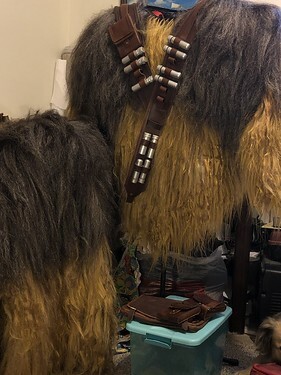 Not going to say what month I plan to have it done or anything because I know better.... however, this is my 2nd wookiee, so should be much easier and faster. I just don't want to feel pressed for time like I did with Dewkazza. I had way too many sleepless weekends where I never saw the sun. No pics yet..... but I did manage to find a pair of Skywalker 2.0 stilts, new in the box. Bought them before anybody else noticed them and the price. They should arrive early next week since they were shipped yesterday. 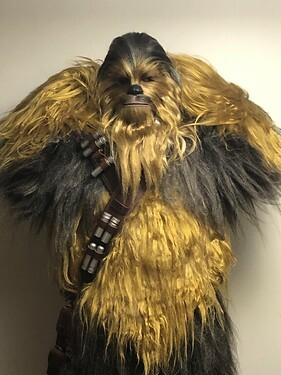 Since I have not made a Chewbacca, I will be reading lots of threads and asking blend questions since I want to make sure I have the correct colors/pattern. In addition, how to make a the pants/foot transition with stilts since my current build is with buckets. Any suggestions from lessons learned also welcome. I'm really looking forward to seeing your build! Skywalker stilts arrived. I tried them on and tried to stand. Not going to be my cup of tea. Later this week I will most likely put them up for sale. They are new in box minus my few minutes of trying to stand up straight. I never got more than 1 step. 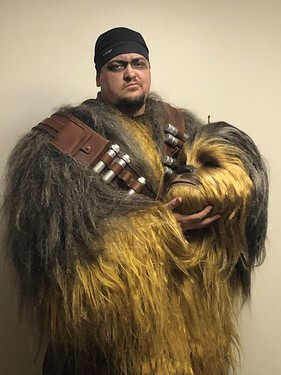 Since my current wookiee is a High Stepper Bucket build, I ordered a set of those last night, got the email this morning they were shipped. YAY! I just hope they are not bright green again this time. lol For this build I will be lowering them though. I want only about 12" of height. After I lower these, Dewkazza will be lowered to most likely to make it easier to walk. Ordered 45 bags of hair. Ordered M4/22 from IKickShins and 4, 144, 27/613 from Sam's Beauty. I split the order like that because I find Sam's cheaper and I tend to order enough for free shipping, so double win! I already have plenty of 44 color hair from my last build. From Amazon I ordered a Hackle to blend hair properly. Some cuff replacements for the stilts so I can make a proper leg brace once I get some metal rods from hardware store. Don't think I have enough left from last build. Mesh- 9 yards from JoAnn fabric. The only black mesh they have really. I was lucky and just happen to catch a 60% off sale on it, so got it super cheap!! Will go to Tandy next time I travel that direction to get leather for the Solo style bando. I am very lucky I have a very good friend who makes prototypes for companies nationally, so he is using some of his free time to design and make the grenade looking pieces on the bando out of resin for me. He does a ton of research and is kinda a perfectionist, so I know they will end up being awesome. Think that is about it for now. Since goggles are not worn the full movie, they should be optional. So I am going to wait till end to work on them. 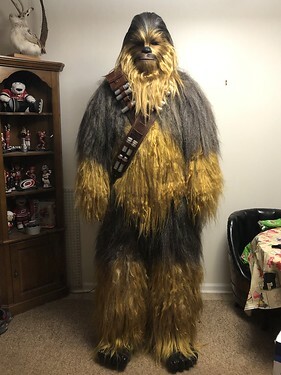 After working on the previous wookiee, I expect this one to go faster and also for me to have some corrections....like a lot less hair on legs/feet. I think I counted every strand of hair when I first started and put it too close (every hole versus every other hole). I also have an idea for how I want to do the feet based on my ninja turtle suit. If I can get my idea onto paper and into reality I think my feet will last a long time and look great, even with my feet up so you see bottoms. That's my small update. I will add more when I have items in hand and can show images that really mean something. loving the plan thus far devlin. I'll be following for sure. did you sell the stilts already....I'm curious about those so maybe shoot me a pm. I cant wait to see all the blending. Looking forward to working with you on this, brother! I tried to reply before but I fell asleep at the computer and closed my page, along with it my post lol. I have everything in hand now. 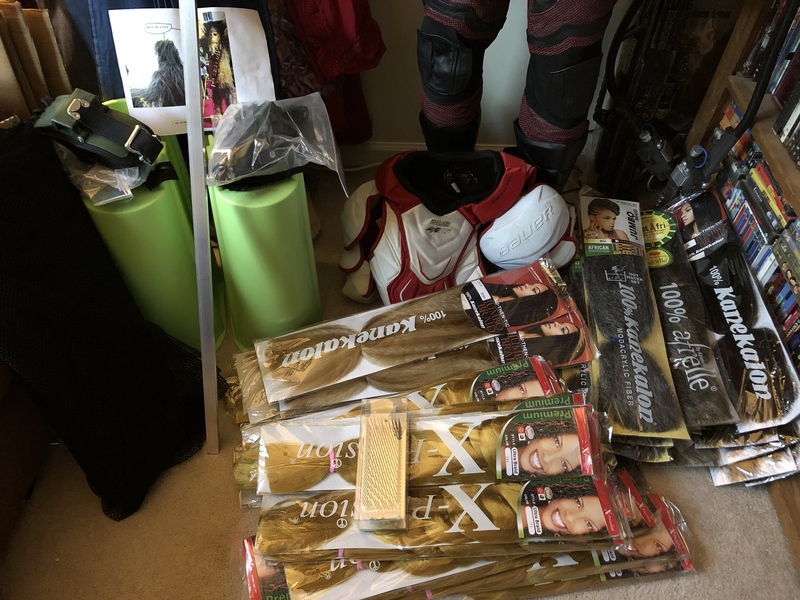 About 16lbs of hair, steppers, parts for braces, jacket for hair blending and of course reference photos. Oh, and Carolina Hurricanes were having an equipment sale so as a season ticket holder I got to go in early. Shoulder pads were last ones left, so they stink a bit but I think my goalie equipment spray will fix that.... but got them for $5!! So look for equipment sales in your area. Everything else I can pull from my current Wookiee box. haha, I fall asleep at the computer all the time. I hate that. looks like your all ready to go, I can't wait to see all the progress. 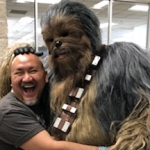 I'm also starting a "Solo" Chewbacca as my 2nd Wookiee. I'll be watching this thread closely. Hopefully we can help/learn from each other. Sounds great! I am a little behind now because of hurricanes and end of fiscal year stuff at work. 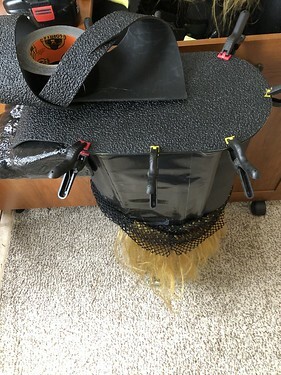 This week I just finished cutting down my stilt buckets, adding rods to the sides, attaching cuffs and gorilla gluing shoes to the top. Tonight I got my mesh top cut out and tomorrow I will cut out the pants and sew everything up so I can officially start latch hooking most likely on Sunday since I will be in DC all day Saturday and drive back Sunday morning. Not looking forward to combining hair, but at least I can do all that while sitting in front of the TV. As long as I don't think about it, it seems to be much easier and go by faster haha. Sorry I have not updated in a while. Been pretty busy with work and had a small vacation a few weeks ago. Much needed! However, in that time I did work on the suit little by little. I took the High Steppers and cut them down to about 12" after calculating how much height I would get from everything else such as mask, shoes, my own height. Cut the rails down to the size that would allow me to have the cuff in a good spot on my calf. Added the cuff, rails and cheap WalMart velcro shoes. They only had them in wide size, so I have plenty of room. Will add some insoles later to help with prolong standing or use my custom inserts. Shoes were semi-permanently attached with Gorilla silicone adhesive/epoxy. My current wookiee has foam for a toe shield. It has worked fine, but I also have to be a little more careful with it because it can easily rip off. This time around I tried to find a trashcan...nothing really the size/shape that would work... so I went and looked at totes. Found this one for $6 also at WalMart. Toe shields installed with almost the angle I wanted. Should work just fine once everything is done. I learned quickly to use a dremel to cut the sides out and a drill to cut holes for the zip ties. Anything else cracks the tote. Noticed the sharp edge at top back of the toe shield was catching on mesh when I tried on pants pattern. Cut those corners down to a curve and used gaffing tape to cover all edges. Used it also to secure the top of the mesh. Mesh also has a very small zip tie on the front and both sides attached to the plastic too. The back is tapped down at the top to help hold the weight up. 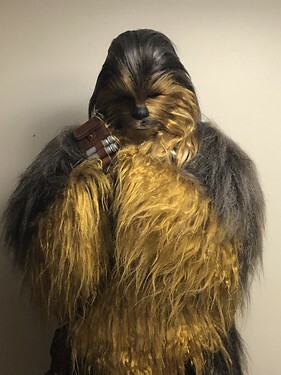 I used duct tape on my current wookiee and no complaints there either. But I really wanted to try gaffers tape this time around because I loved it when I was working in television. It has a very thin rubber/cloth like center and the sticky side is pretty much like duct tape in strength. So to me it was the next level. Time will tell. Pants were cut from same pattern I used on my current wookiee. XL, pajama pattern. The bottom was cut more liberal and slowly matched to the pattern to give a natural look. The bottom was taken from measurements of the widest part of my stilts with the shoe in. This waist is elastic and will add clamp style suspenders once build is closer to done. Now I am spending the beginning of the week blending hair. I have a trip at the end of the week for work, so taking a bunch of hair with me to work on it while sitting in the hotel room. Becoming kind of a trend for me to do that. But keeps me from spending money I don't have. Hope to share more next week when I have a little more progress. As far as the Stilt buckets go, are you piecing them together or are they sold that way? I'd love to go this route and ditch my KISS boots. Any info on where you got them or how you put them together would be awesome! I feel pretty bad for not taking more pics of my build. I was in such a hurry to meet my self imposed deadline all I could do was think about latching hair. Just a little frustrated I was using a smaller mesh and latching more hair then needed. Makes me a little more chunky, but I can slowly work on making it look and fit better. I was not a fan of the foam I used on my other buckets. This time around I wanted to do something close to what I did with my ninja turtle to keep bottoms in good shape and prevent damage as long as possible. I ordered a few sheets of sole rubber. I cut it out to the shape of the bucket plus some under the toes. Figured this would last a while so used E6000 to glue it down. Also placed 1 piece of foam inside the buckets to help muffle sound. Even though this picture does not show it, I also have 4 small screws in the corners to help keep the rubber from moving. The E6000 does a good job, but I am super cautious and try to plan for the worst. The screws are in pretty tight so when I walk they are not scratching up the floor or clicking. The toes are foam with flex-seal coating. They are screwed onto the steppers and a small piece of foam tucked into the top to force the toes downward more. Did a test fitting at some point to see how the top looked. It seemed okay, just a little long. I trimmed it a little but think I need to maybe do a little more or curl it more since that shrinks it too. Missed my deadline of Dec. 31 because I started late and had a few interruptions, but I managed to finish this week and submitted. Staged my main items as I was making sure I had everything I needed. I can honestly say I hate curling/wave irons as much as latching. Had to put curls in the entire suit. The greyish brown did not care for it at all so I stopped trying after a little while. Going to have to practice on some strands to see if I can get more curl. The goldish blond was easy to get to curl. This is how I felt after getting ready, taking photos and discovering the bando was on backwards once I undressed, sat down and was ready to relax and submit photos. So... had to put it all on again and retake images....UGH.